I don't often review picture books these days....but a little while ago, one came unasked, unlooked for, unexpected, in the mail-- Elephantastic! by Michael Engler, illustrated by Joëlle Tourlonias (Peter Pauper, Jan. 2015). And I enjoyed it (in as much as a klutsy person can enjoy reading an unbound galley--there were droppings and muddlings of pages) and I shall now try to review it, unpracticed though I am in the gentle art of the picture book critique. The rich, warm tones of Tourlonias' illustrations invite the reader to go on a journey far from the confines of an urban apartment deep into an imagined Africa....or something. Basically, an imaginative boy opens a large box that wasn't meant for him and inside is an stuffed elephant who is alive. 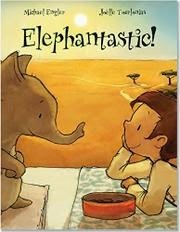 Boy and elephant play games of African exploration and adventure...but then, Sadness! The elephant must go to its intended recipient, the girl in the apartment upstairs....tears are shed. Happily, the girl and the elephant come back down to play with the boy, and all is well. I now go to check what the pros (in this case, Kirkus) had to say. My eyebrows shoot upward at their leading line-- "Inattention results in a potential domestic tragedy in this German import." This is more sturm und drang-ish than I think is warranted. I do, however, agree that the type is rather small (reading it aloud in dim bedrooms with inadequate light might be tricky) and more happily, I can agree that it is "a sweet celebration of the imagination" (although with reservations viz portrayal of Africa...).